I am getting some conflicting info. Do we still need 1 IP everyday in Phase 3, are all veggies allowed now? Side note: Can we have raw nuts in PH3? On the first page it states that the ONLY meal that changes between phase 2 and 3 is breakfast - which would mean that you are still measuring your veggies (4 cups per day as in phase 2), and still having the IP product snack. You should be able to incorporate nuts into your breakfast, but I'd be curious how people count them (as protein or fat). I would probably be inclined to count them as a fat, but it's a bit of a gray area. Do on griddle on med-high heat. Serve with fresh berries and WF syrup. YUMMY! Ooohh, I LOVE trying out new pancake recipes! I may throw in some canned pumpkin (as my 'fruit') to get into the October spirit! You still have 1 IP as your snack in Phase 3. You are still on the same Veggie List in Phase 3 that you were in Phase 1 and 2. You can add in raw nuts in Phase 3 in your Breakfast. bumping as I'm making my way towards phase 3! Congratulations! And I love the wedding dress photo! Wow! Good idea! One recipe did call for applesauce but I'm not a huge fan of that. I AM a huge fan of pumpkin though!!! Next Wednesday (Oct. 24), I start Phase 3. IP has been great and I am so appreciative of my coach and this forum. I have decided not to reintroduce grains into my diet (I sure will miss my bars). Has anyone else done this and what has been your experience? So what peanut butter do you all use and what is your favorite bread? Thanks! I started to and felt really yucky so I backed off to just about no grains. I've been using coconut flour and almond flour in different recipes. I like it much better this way! I must have been intoleratant to a certain extent before but just didn't realize it. See my previous post on coconut flour pancakes (just a few posts up) - that's how I did my carbs in the morning. Remember you can always use the proti diet bars and IP bars still. Try PB2 it's a powdered PB made with coconut sugar, you just add water and it's great! Bread's a tough call - I like putting my PB on an apple but peppridge farms has some really good breads like the ancient grains and the all natural. As for bread, i list the brand and stats in my recipe info. Generally lean towards the lowest cal, ~35-40. calories/slice. I have been cutting down on the grains, out of both laziness and vanity with no ill effects. I found i get slight bloating with bread, dont crave it, and its easy to make the custard for pumpkin pie or cheesecake with no crust, thats my fave part anyway! My cholesterol is high so I was thinking of egg beaters rather than whole eggs. Is that a bad thing? 1. Mix together Egg, Egg Whites, Ricotta Cheese, Sweetener, and Lemon juice & zest together. I used a fork..
2. Add in Pancake Mix and gently mix together with a fork (don't want to over mix). 3. Slice up Strawberries, or fruit serving of choice, make your coffee, etc while you cook up your pancakes. 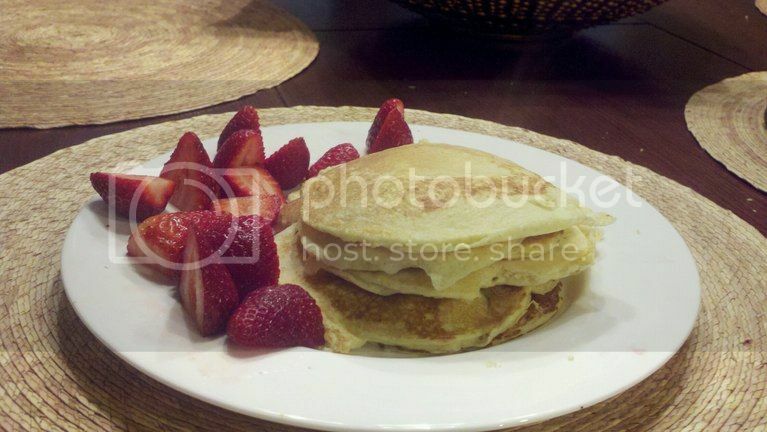 *These were some of the best pancakes I have EVER had. They come out 'melt in your mouth', which isn't a way I have described pancakes before, even using the 'low-carb' pancake mix. *i didnt need any WF Pancake Syrup, but I did put sweetener in the mix. I finally got around to making these today... delicioso. Thank you for the recipe. I've been mostly using the PB2 with Ezequiel bread or eggs w/toast & bacon or Kashi cereal, so these pancakes were a nice change. They didn't take long to make either! Last edited by momat40; 10-22-2012 at 09:00 AM. I've been working on cutting out the 'whole eggs' myself for the same reason. I've been moving towards all egg whites and haven't noticed any differences. I don't see why Egg Beaters would be bad. I LOVE those freaking ricotta pancakes! I'm going to try some with Low Fat Cream Cheese and Pumpkin Puree and see how they turn out. I'm inspired by October! You are missing out on good fat and nutrients in the yolk. Cholesterol seems to becoming an issue of the past. Recent studies have shown low cholesterol associated with higher risk of death. I would keep the yolks! Just bumping again as I'm trying to plan for next week. I bought bread today. And raspberries. SOOOOO excited!! !